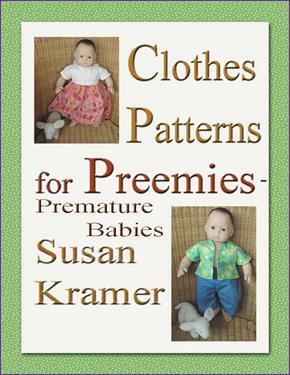 Five full size patterns for premature babies. My 16 inch (40cm) and 17 inch (42.5cm) baby dolls are modeling the outfits. 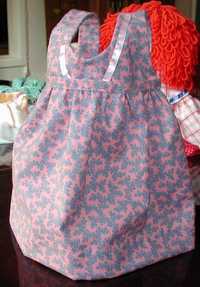 I recommend sewing with soft cotton fabrics and not placing scratchy seams against baby's skin. (Seams can be enclosed with seam binding.) This is an opportunity to recycle items of clothing that have been softened by many washings. Patterns are perfect for your group sewing project, for the tiniest babies. Instructions are given in inches and centimeters. Patterns are ready to use. Photos of finished outfits are included. A photo of each finished outfit is below.